God has dreams—just for you. Becoming Myself is a hope-filled book for anyone who wonders if her life will ever change—if she will ever change. In Stasi Eldredge’s most intimate book yet, she shares her own struggles with self-worth, weight, and her past as she shows readers how God is faithfully unveiling who we truly are. Stasi urges you to lay down your past thoughts about yourself and receive God’s incredible dreams for you instead. We cannot heal ourselves. We cannot become ourselves by ourselves. But we are not by ourselves. The King of love wants to help us become. God desires to restore us—the real us. As he heals our inner life, he calls us to rise to the occasion of our lives. The most important journey any woman can take is the journey into becoming her true self through the love of God. It's a beautiful paradox. The more of God’s you become, the more yourself you become—the “self” he had in mind when he thought of you before the creation of the world. 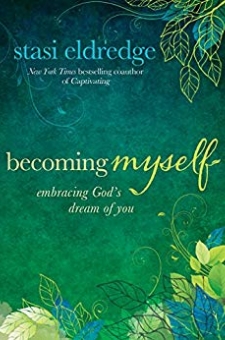 Discover your truest self—the woman God created you to be—in Becoming Myself.Stasi Eldredge’s heart was captured by God through the Sacred Romance and she has never gotten over it. Or rather, Him. She is the co-author (with her husband John) of the New York Times Bestselling book Captivating and Love & War. Their ministry, Ransomed Heart, has been used by God to transform the lives of men and women all over the world. They make their home in Colorado. The mother of three grown sons who no longer live in her home but take residence forever in her heart, Stasi is a writer and conference speaker passionate about women embracing the value of their heart and life to Jesus Christ and risking everything on that!